1) Supports resolutions up to 1080P, 3D, 4K & HDMI Ethernet Channel. 2) Supports a full range of high definition audio types, including SA-CD, DVD-Audio, DTS-HD Master Audio™ and Dolby TrueHD™. 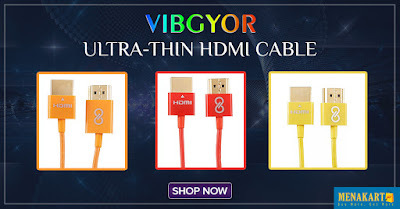 3) Its 50% thinner than most other HDMI cable. 4) Gold connecters and Bandwidth up to 18Gbps. 5) Ideal for Home Theater Systems and Ultrabooks. 6) Cable Length - 1 Meter.